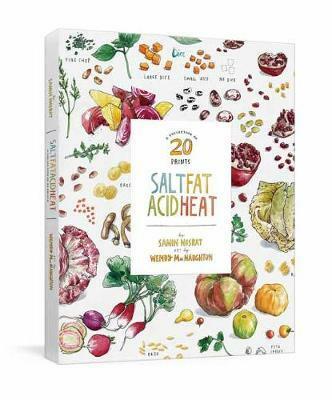 Twenty stunning prints from the bestselling and James Beard Award-winning Salt, Fat, Acid, Heat by Samin Nosrat with art by Wendy MacNaughton In 2017, the world was introduced to Samin Nosrat's masterful guide to foundational cooking and Wendy MacNaughton's accompanying artwork that brought it to life. Now, twenty of the spectacular illustrations from the bestselling Salt, Fat, Acid, Heat are collected as beautiful 8 x 10 prints. As in cooking, each piece of artwork was created using all five senses. While Samin cooked and taught, Wendy drew and took notes. And smelled. And touched. And tasted. And tasted again. The resulting pen and watercolor drawings celebrate the four elements of good cooking: Salt, Fat, Acid, and Heat. At once beautiful and useful, designed for framing, but perfect for anywhere, these prints will inspire you to cook and draw in the same spirit they were created: thoughtfully, fearlessly, with friends, and a whole lot of laughs. SAMIN NOSRAT is a chef, teacher, and author of the best-selling, James Beard award-winning Salt, Fat, Acid, Heat. She has been called "a go to resource for matching the correct techniques with the best ingredients" by The New York Times and "the next Julia Child" by NPR's "All Things Considered." Samin is an EAT columnist for The New York Times Magazine and can be found eating, cooking, and laughing in the "Salt, Fat, Acid, Heat" documentary series on Netflix. WENDY MACNAUGHTON is a New York Times bestselling illustrator and graphic journalist known for her unique approach to visualizing information and telling stories through drawing. In addition to Salt, Fat, Acid, Heat, her books include Meanwhile in San Francisco, The Gutsy Girl, Leave me Alone with the Recipes: The Life, Art, and Cookbook of Cipe Pineles, Knives and Ink, and The Essential Scratch and Sniff Guide to Becoming a Wine Expert. She is the back page columnist for the award-winning California Sunday Magazine.